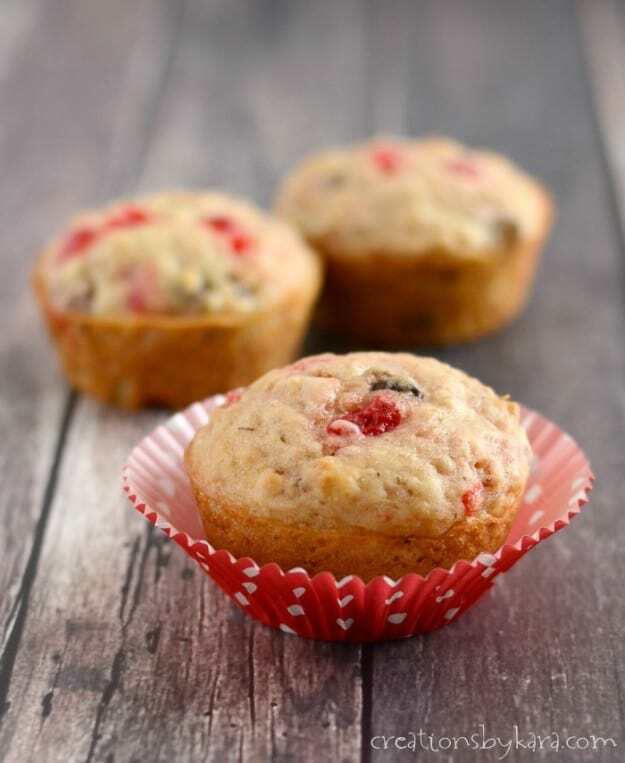 Cherry Chocolate Chip Muffins – These pretty little muffins are perfect for Valentine’s Day, but they are so yummy you will want to serve them all year long! Chocolate chips for breakfast are always a hit at my house. We also love toasted oat chocolate chip muffins, chocolate chip scones, and chocolate chip pancakes. 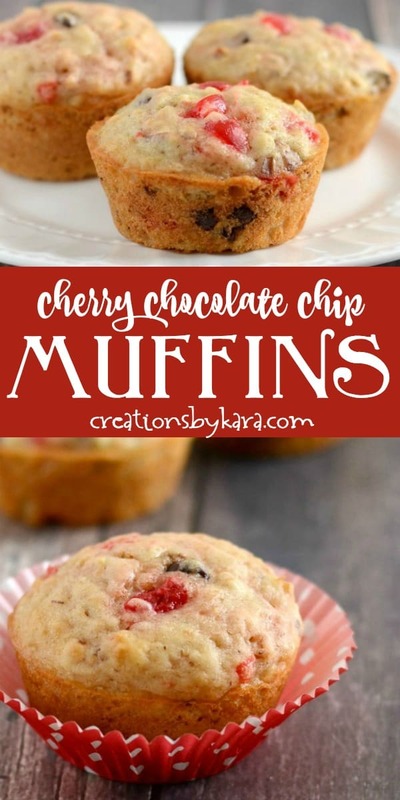 I love cherries, chocolate, and almonds, so I really like these muffins. Of course, you can substitute pecans or walnuts, or just leave the nuts out altogether. The granola adds fiber (who doesn’t need that!) and also makes them more filling. It’s a perfect way to use up the leftover granola at the bottom of the bag. Combine dry ingredients in large bowl. Beat together egg, buttermilk, oil and vanilla in a small bowl. Add to dry ingredients with nuts and chips. Stir just until moistened. Fold in cherries gently. 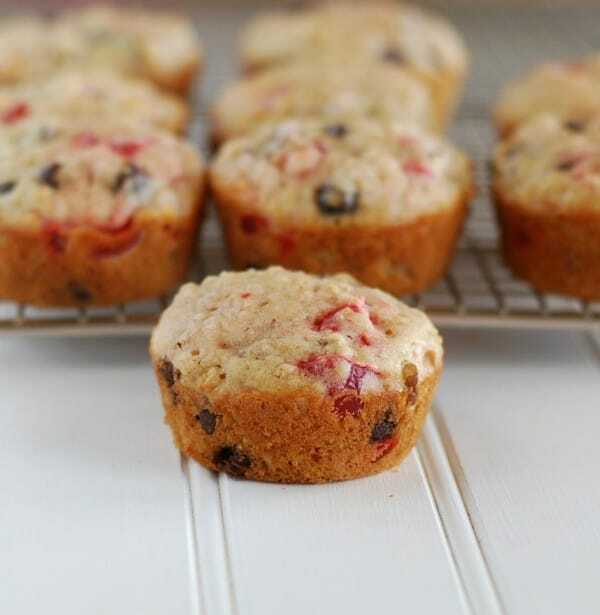 Fill greased or paper lined muffin tins 3/4 full. Bake at 350° for about 15 minutes. Cool in pans for about 5 minutes before removing to cooling racks. 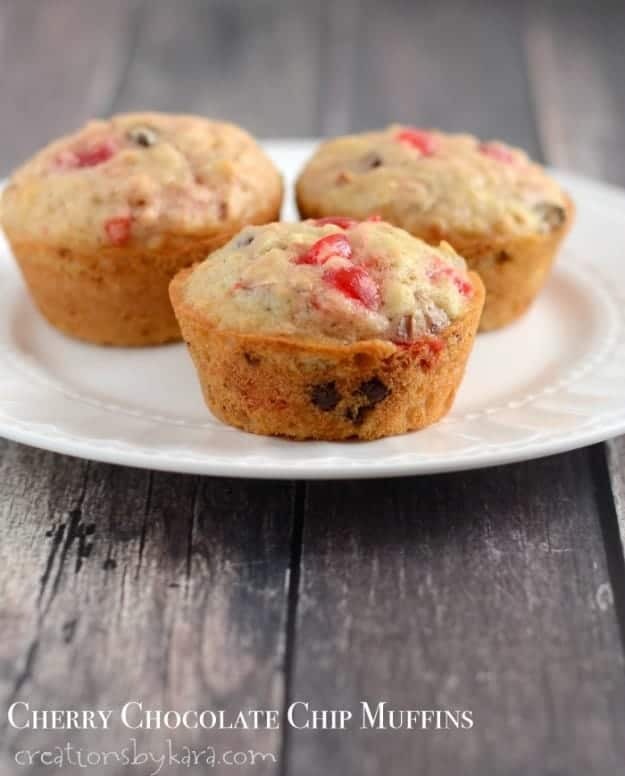 How to store chocolate chip cherry muffins: These muffins will keep for 2-3 days at room temperature in an airtight container. If you want to store them longer, they freeze really well. I put mine in gallon freezer ziplock bags. They will keep for about 2 months in the freezer. I love the way they look with the pretty pieces of cherry peeking out. And of course it’s delightful biting into a juicy cherry. I was planning on storing the leftover muffins in the freezer for another day, but my family scarfed them all up. Next time I think I’ll make a double batch. Enjoy! 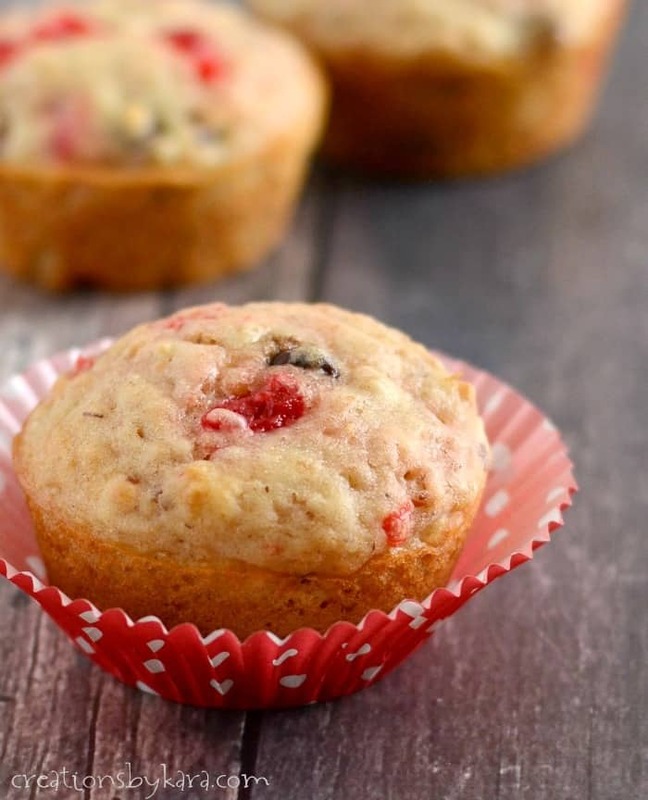 Hearty muffins with granola, almonds, chocolate chips, and maraschino cherries. Combine dry ingredients in large bowl. Beat together egg, buttermilk, oil and vanilla in a small bowl. Add to dry ingredients with nuts and chips. Stir just until moistened. Gently fold in the cherries. Fill greased or paper lined muffin tins 3/4 full. Bake at 350° for about 15 minutes. Cool in pans for about 5 minutes before removing to cooling racks. -Recipe originally posted Oct 24, 2008, updated 2/2019. These sound so delightful!! Perfect for Valentine’s Day!!! You are so welcome! I’m glad they are a hit at your house! I love to have these on hand to snack on! Same here – I love keeping a stash of muffins in the freezer! Cherry & chocolate is the yummiest combination!! These look so soft & would hit the spot, when I’m needing a little snack. Also, my kids would love these! They love cherries & chocolate! Cherries and chocolate are a match made in heaven, yum! I totally agree – especially for Valentine’s Day! Super fun for Valentine’s Day! These muffins are so cute and festive!